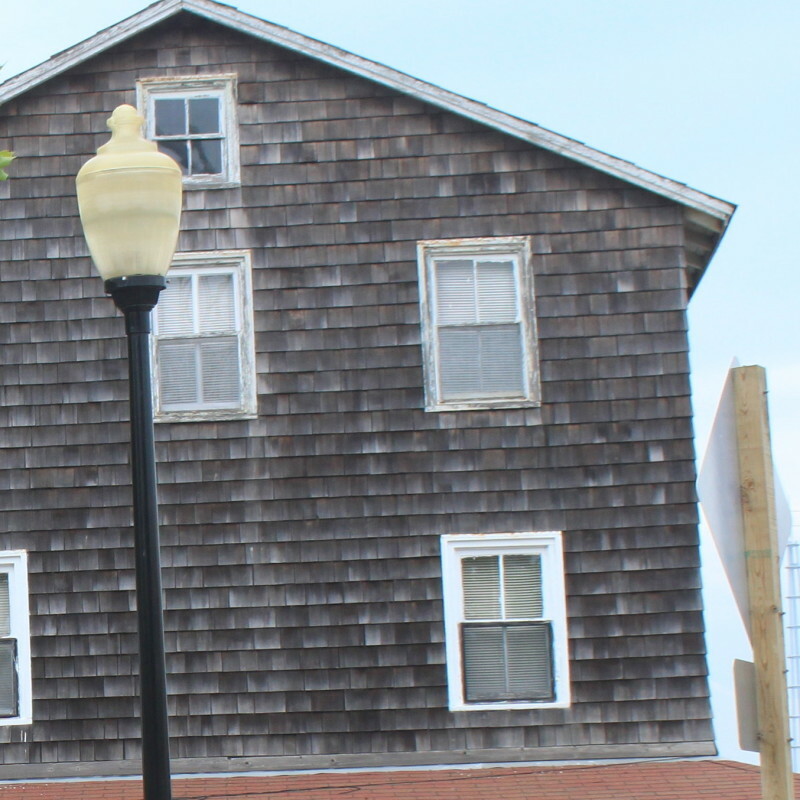 The old Henry Hotel still sits vacant at the corner of Baltimore and South Division Street in Ocean City, Maryland. Most people would never notice this three story, 20-roomed hotel, covered with brown shingles across from Trimper’s Rides. The entire hotel is about the size of most single family homes found in upscale Western Shore neighborhoods. The Henry has been out of commission since its most recent owner, Pearl Bonner died in 2003. Pearl was a legend in her own right, when as a single, African American woman raising three daughters she purchased the property in 1964. For forty summers she ran the hotel, putting her daughters to work when they needed money for their college educations. All of them are college graduates. Pearl ran the hotel more as a rooming house for African American men who worked in Ocean City, rather than a vacation destination for black patrons looking to relax. The Henry Hotel was built by white investors around 1895 as a lodging site for African Americans. This was a time of segregation, when hotels and restaurants employed black workers but could not allow their patronage due to segregation laws. Workers of color couldn’t stay in the hotels where whites stayed. Big name black entertainers could perform for summer visitors but couldn’t spend the night in the same building that accommodated their white audiences. 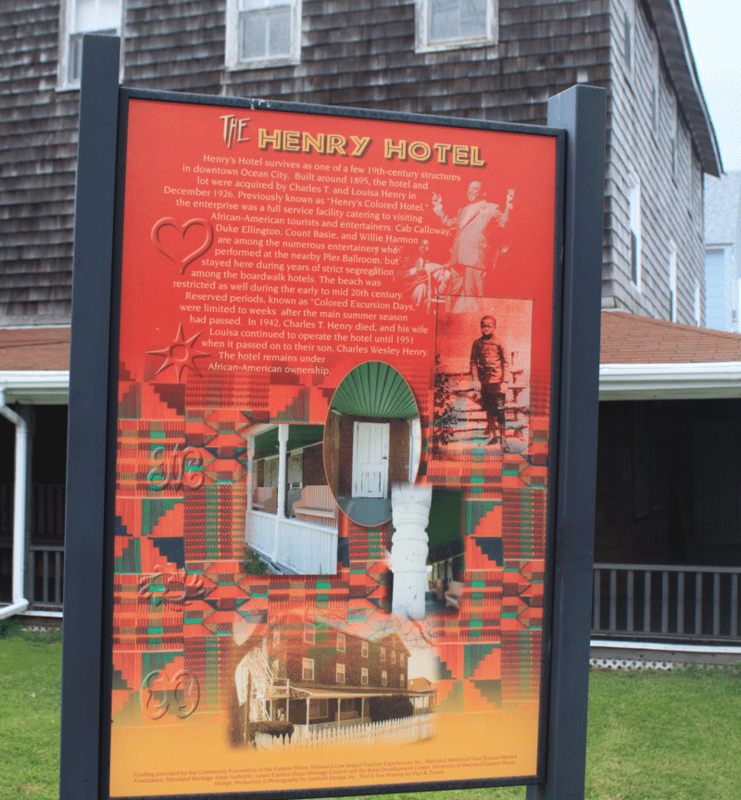 The Henry Hotel is the only surviving “colored hotel” left in Ocean City. In 1926 an African American mail carrier named Charles T. Henry and his wife Louisa bought the hotel and renamed it “Henry’s Colored Hotel.” The Henrys engaged the community, and offered a spirit of entertainment to black guests rather than just a bed for the night. They added a restaurant, a laundry and a night club across the street. They welcomed the black entertainers including Cab Calloway, Duke Ellington, Louis Armstrong, County Basie and a very young-at-the-time James Brown. All were guests at the Henry’s Colored Hotel. 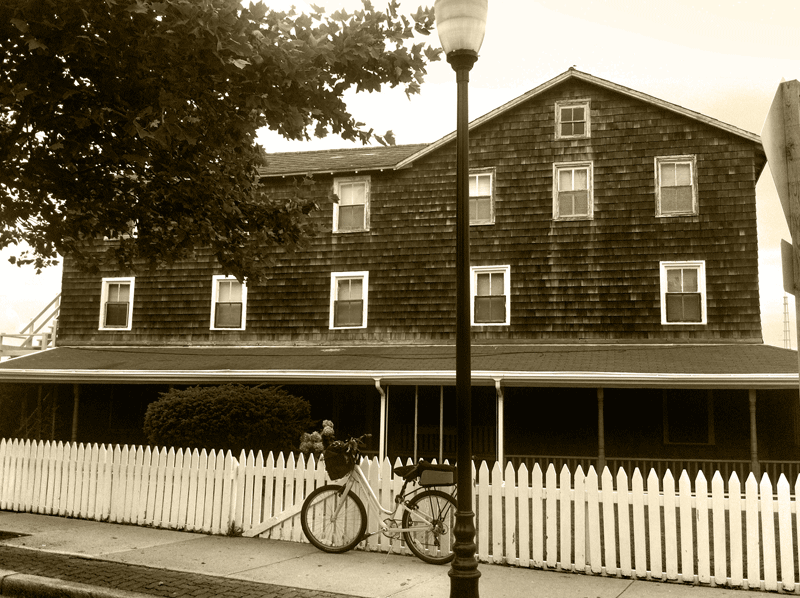 I wanted to include the Henry Hotel on my Ocean City Ghost Walk. I was so hoping that it had a “haunted” history. The Nabb Center at Salisbury University houses a Folklore Collection that includes transcribed oral commentary given to University students in the 1970s. There are thousands of pages of commentary in the collection, including stories of ghosts and hauntings. I found only one piece of commentary about the Henry Hotel. It was short – less than 150 words, given by an African American male informant in 1973. He was 61 years old at the time. He lived in Berlin but worked in Ocean City as a maintenance man and said he’d walk past the Henry Hotel in the evenings when he’d catch his ride home. The informant said in the summertime he had no issues with walking past the hotel. But when winter set in, the town was closed up with few people on the streets. Walking at night was a lonely ordeal. He said when he walked past the Henry Hotel he would hear music – like a party or a dance – coming from inside. He could see that the hotel was empty, closed for the winter. There were no lights on or visual signs of any occupants. But there was music playing. He walked up closer to the building trying hard to hear where it was coming from, but the closer he got to the building, the more faint and distorted the music became. When he stepped on the grass in front of the house, the music stopped. But it started again as he walked away from the hotel. This happened several times – always with the same result. It bothered the man so much that he changed his walking route. So where did the music come from? There was one other testimony about the Henry given to me personally by a West Ocean City resident. He said he once worked on the Henry Hotel in the off-season doing some repair work. He said, “It was a strange place. Like it was empty, but not empty.” He was hesitant to elaborate. I wanted the Henry Hotel on the Ocean City Ghost Walk because of its rich story of culture and heritage, but one shred of commentary about hearing music and an unconvincing comment about the hotel “being empty but not empty” wasn’t enough to warrant a spot on the tour. So I paid my own visit to the Henry Hotel to get a sense of the place. I went both during the busy daylight hours in July and then again after midnight when town was quiet. Seeing the Henry in the silence of the early morning hours makes a big difference. I stood out in front of the hotel for awhile, then spent some time walking the length and breadth of the corner property. The man who said “empty – but not empty” was right. The was something more to the hotel than brown shingles with chipped paint on the window frames. There was something richly “filling” the space in and around the building. The Henry has a pulse. A pulse that beats out a life story … a will to survive – a tale worth telling. I strove to find out all I could about the Henry Hotel. I interviewed at least a dozen people – historians, merchants, old timers. They offered nothing. But something came to me when I wasn’t trying to find it. 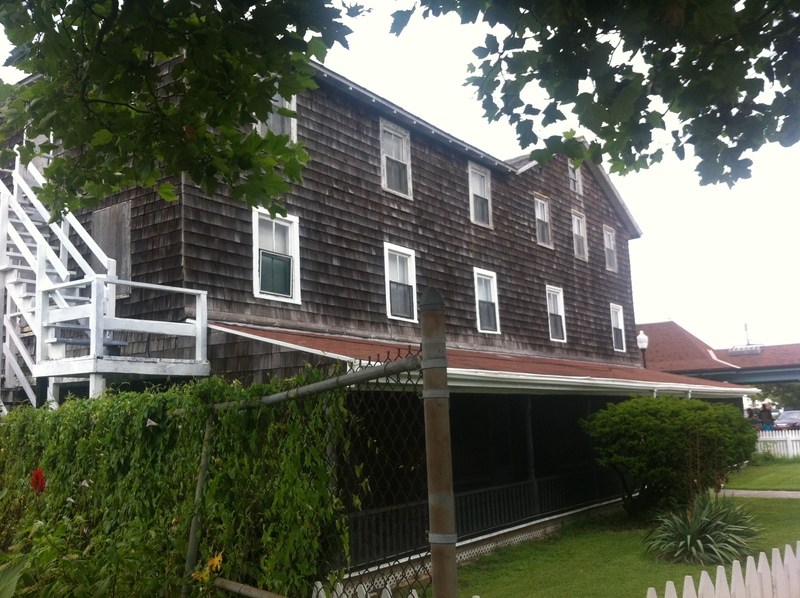 I was in another part of the City – the Bayside Fishermen’s Homes, doing ghost walk research. The whole street is lined with bungalows that were former homes to fishermen and tradesmen. I was interviewing people there about histories associated with their houses when a young man on a bicycle stopped and listened to my interview with one of the residents. He was interested in ghost stories, I think. I asked this young man if he knew of any famous haunted sites in Ocean City. He said he didn’t, but then backtracked and said, “There is one creepy place.” He referred to the old brown house across from Trimpers near the bus station. He said he’d go down to the Inlet in the off season and have to walk past it. 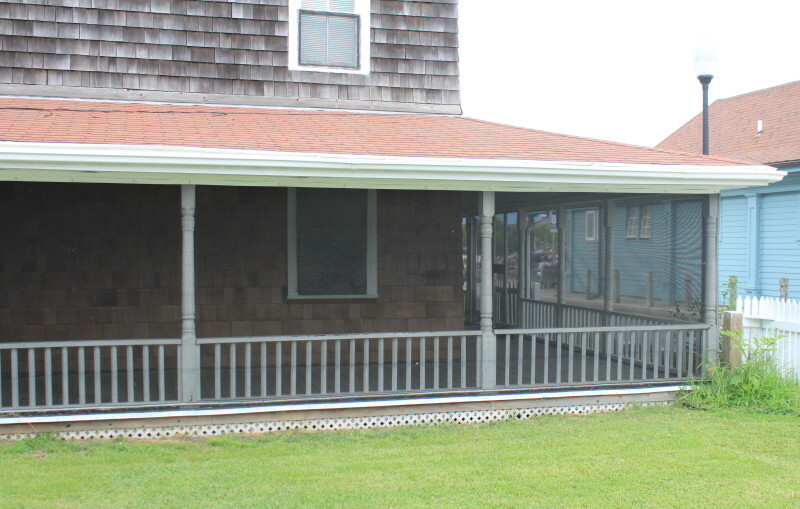 He knew it was vacant, but one night he saw someone on the screened porch looking at him. He said it was very late – and weird to see someone there. When he looked closer, he saw he was mistaken. No one was there. But it happened another time, and that time he was sure he saw someone or some thing – but when he took a closer look, that someone had vanished. I don’t know if the spirit of Pearl Bonner is still waiting for guests to come in for the night, or if previous (long deceased) guests are partying and playing their music into the early morning hours. But I do know that the Henry Hotel has a presence about it. It is also the one site where guests on my Ocean City Ghostwalk get the most number of abnormalities in the pictures they take there. It’s gotten so that I tell my non-picture-taking guests to sit down for a minute on the bus station benches to wait while the picture takers look at each others images with orbs and shadows and strange elements. If you believe in ghosts, you should visit the Henry Hotel. If you don’t believe in ghosts, you should visit the Henry Hotel. You’ll marvel at this how this old relic has survived…. at how it still occupies one of the most prime pieces of real estate in Ocean City whilst generating no revenue for its owners. Why has it stuck around for so long? Why does it make some people feel so uneasy? Why do ghost walk guests get so many abnormalities in their pictures? What about the coincidences when I was doing my research? The man on the bicycle coming around just when I needed confirmation, talking about someone watching him on the porch. The Sun article stating Pearl Bonner waited up for her male residents. Here’s one more unrelated coincidence. I came across the land records for the Henry Hotel in my research. I scrolled through the listing of property transfers and noticed that the contract purchaser who transferred the property to Pearl Bonner had the same name as my friend’s ex-husband. I asked her about it. Turns out it WAS her ex-husband. The Henry Hotel has a story to tell. It may be different for each person, but I’m convinced it’s a story worth hearing. What story did it tell you? do you do ghost walk in winter ? Chesapeake Ghost Walks, does tours all year long. We have ghost walks through December and then do bus tours in January, February and March picking up sites in areas beyond the boundaries of the walks. You can check out our calendar of events on http://chesapeakeghostwalks.com/events and also sign up for our newsletter at http://chesapeakeghostwalks.com/newsletter/ to be kept informed about upcoming walks. thanks for inquiring. I took your tour a few days ago and was telling my father all about it. I loved it! Talking about the Henry Hotel, i couldnt remember if you had said that african americans where still seggrigated in ocean city up untill 1975. This has become the big discussion in my house hold right now. I would love for you to get back to me, thank you! Brianna, the Civil Rights movement of the 20th century is long and detailed. The Civil Rights Act of 1964 outlawed discrimination, but it took years for civil rights supporters to force those trying to get around the law to comply. It wasn’t until 1975 that integration was forced in the schools through the practice of bussing and that was the final step in forcibly putting these two diverse communities into one another’s company. Prior to 1975, there were very few Blacks in Ocean City’s beaches, boardwalk, hotels, etc because the public environment was not welcoming. I worked as a musician at bars and restaurants in Ocean City for years. Whenever I worked in Old Town, after my gig, I’d have some drinks and wander to the old Henry Hotel. Before the porch was screened, I’d sit there on the bench, pondering the history of the musicians that stayed there; I felt so drawn to it. Often I’d fall asleep on that bench. I still walk by there when I can. Funny, Rob. I feel the same way. I think all musicians would. Just to think about the fun they must have had there in the evenings. I’m so glad the Bonner family has decided to keep it there as a landmark and the yard and grounds are kept up so well. Thanks for stopping by the blog. Thanks, Beth. best compliment I’ve had all day and it’s already 1:30 pm. Luv u. Thanks for the kind words. And someday, I’m taking you on one of these tours. Convinced you didn’t have a whole lot, I read on. I am now convinced otherwise.I like the story a lot. Why do ghost walk guests get so many abnormalities in their pictures? Favorite summary question. I am hoping that the Henry Hotel has more life left in it. Hey Shalagh. They Henry Hotel has a special energy. It was fun to write about. I believe the Bonner daughters are hoping to turn it into a museum / perhaps a B&B. I figure it will be around for awhile. Thanks for the kind words.